Solander fishes by the surface longline method for Tuna species (Big eye, Yellow Fin and Albacore) and associated pelagic species in the Fiji EEZ, congruent EEZ’s and High Seas. It also fishes in the Fiji EEZ by the bottom line method for species such as Snappers (Onaga, Opakapaka) and Groupers. All vessels supplying Solander, whether owned by Solander, contracted or privately owned are Fiji Flagged. As such these vessels operate under the licences and jurisdiction of the Fijian Ministry of Fisheries and Forests (FMFF). Our fleet is predominately manned by Fijian crew and all vessels are based in and operate from the port of Suva. 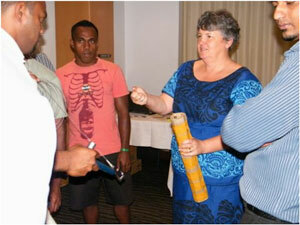 Fiji has a sophisticated fisheries research, management and monitoring system. Fiji is a signatory to the Western and Central Pacific Fisheries Commission (WCPFC) which was established by the Convention for the conservation and management of Highly Migratory fish stocks in the region. Fiji is signatory to UNCLOS and all relevant UN conventions on the management of fish stocks in the South Pacific. Fiji is a member of the Forum Fisheries Agency (FFA) in Honiara which agency monitors Solander vessels under its Vessel Monitoring Scheme (VMS). The Secretariat of the Pacific Community (SPC) in Noumea provides the logbooks and catch data requests to which Solander complies under direction of the FMFF. The Secretariat of the Pacific Regional Environment Programme (SPREP) provides direction and instruction on environmental issues specific to the area in which we fish. Fiji adheres to the recommendations of WCPFC in relation to sustainability, ecologically related species (ERS) and catch reporting. The SPC undertake scientific and resource studies and provides input into the WCPFC scientific committee. Regional Total Allowable Catches (TAC’s) are derived from this information. The WCPFC consider that Albacore and Skipjack are currently fished at sustainable levels. Big Eye and Yellow Fin are under some pressure and subject to likely catch reduction. Fiji – being a responsible fishing nation – has pre-empted any likely reduction by limiting available Tuna licences in its EEZ to 70. Previously the “cap” on Fiji Tuna licences was 110. Solander’s right to fish is governed by Fiji’s allocation and jurisdiction. Longline caught Albacore taken from the Fiji EEZ is currently under pre-assessment for MSC accreditation. Solander vessels have OPRT (Organisation for the Promotion of Responsible Tuna Fisheries) accreditation as responsible tuna fishers. OPRT is an international tuna monitoring organisation based in Tokyo. There is virtually no “non fish” bycatch within the Fiji EEZ. Predation by whales is of serious concern to the fishing community but has no adverse effect on the whales themselves. Solander crews are trained in the release of seabirds and turtles but these incidences are rare indeed in tropical waters. We use only circle hooks. The longline fishing method creates no damage to the seabed or benthic communities. Arguably it is the most environmentally sensitive of all commercial fishing activity. Solander prides itself in adhering to all relevant management regimes enacted in the interests of sustainable fishing, ERS and non fish by catch. Management and seagoing staff are acutely aware of environmental issues and our business is managed accordingly. Solander, in Fiji, does not catch or trade in Turtles or Sharks. Strict legislation in Fiji prevents such commercial activity. In this position statement we will identify the legislation but also, more importantly procedures, that we adopt to mitigate against accidental capture and what is done when there is any incidental by-catch. Solander targets the catching of tuna by surface long lines and with Fiji flag vessels only. As such the fishing activity is governed by the laws of Fiji which contain very strict rules concerning Turtles and Sharks. The vessels use circle hooks and do not use wire tracers consequently accidental catch is minimised and release of live animals made more easy. There are five species of Turtles in Fiji but we only interact with two. These are Green Turtles (Chelonia mydas) and Hawksbill (Eretmochelys imbricata). 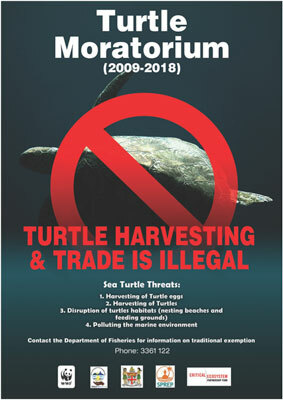 It is totally prohibited to commercially trade in turtles in Fiji. Each year we will land alive 2 or 3 turtles only amongst a fleet of twelve vessels. The turtles are released alive back into the sea and handled with care and respect. To do this we carry Turtle Release Gear (de hookers) and it is mandatory under law to do so. Our crews are trained in the release of Turtles and courses are run on regular intervals. The most recent course being organised by WWF and we appreciate their involvement in crew training and education. All vessels carry a booklet showing the safest way to handle turtles of different sizes and explaining the use of the release equipment. The management of sharks within the Fiji fleet is under direction of the National Plan of Action √ Sharks (NPOA-Sharks). This follows closely the International Plan of Action Sharks issued by the FAO, Rome. The Fiji NPOA is more strict than the International version. 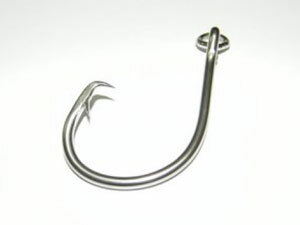 Solander is prohibited from targeting sharks under the NPOA and any alive sharks must be released unharmed to the sea. Any sharks caught dead, if landed ashore, must been done with fins naturally attached. In practice it is now rare indeed for any sharks to be landed. Crews are instructed on the release of live sharks which is made more easy by the use of monofilament branch lines and the prohibition of wire tracers. The tourism industry is very important to Fiji and diving with sharks is a popular pastime. This occurs primarily inside the reefs where Solander is not allowed to fish. Notwithstanding we maintain close contact with the tourism industry reporting sightings of Tiger or other sharks of interest to the important recreational sector. Fiji is a member of the regional tuna Regional Fisheries Management Organisation (tRFMO) known as the Western Central Pacific Fisheries Commission (WCPFC) and is bound by Conservation Management Measures (CMM’s) as issued by them. As such the landing of even dead sharks such as Silky and Ocean White Tip is prohibited. Fiji has passed legislation and instituted regulations over time banning the killing or capture of turtles. The most recent regulation is the Fisheries (protection of Turtles) (Amendment Regulations 2010). The Fisheries Act (Cap 58) prohibits the harassing, taking or killing of turtles or their eggs. The recently introduced Offshore Fisheries Management Regulations provide for heavy penalties on vessels and their owners for any breach of conditions placed on their fishing permits. These conditions include non-take of turtles and prohibition of targeting for sharks. Solander and the Fiji Government jointly share the same concerns on the preservation of shark and turtle species. Conservation is practiced by both in a positive and practical way to standards the envy of many.